WASHINGTON — President Donald Trump offered praise for the U.S. commercial space industry in comments March 8 that appeared to cement previous policy on the issue rather than create new policy. 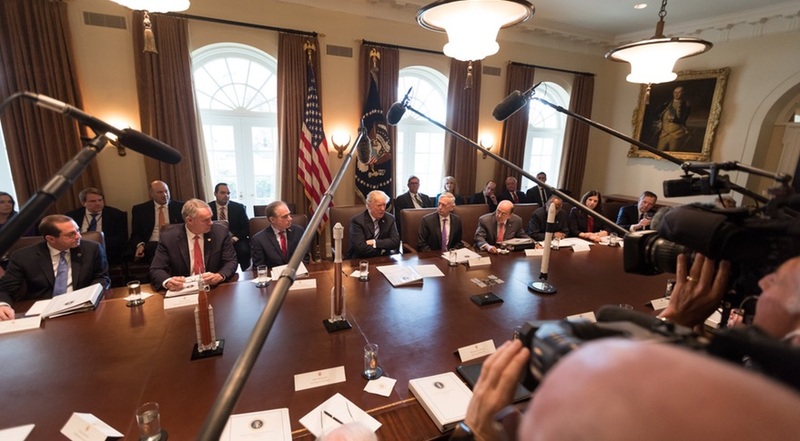 Near the end of a 20-minute session with the media during a Cabinet meeting, Trump discussed commercial spaceflight, prompted by the presence of models of several launch vehicles, including United Launch Alliance’s Atlas 5 and SpaceX’s Falcon 9, on the table. The status of the National Space Council, chaired by Vice President Mike Pence, was one of the topics of the Cabinet meeting. Trump appeared particularly interested in last month’s successful inaugural launch of SpaceX’s Falcon Heavy rocket, which featured the synchronized landings of the rocket’s two side boosters back at Cape Canaveral. “To me that was more amazing than watching the rocket go up, because I’ve never seen that before,” he said. He was also pleased with the vehicle’s price. “They said it cost $80 million,” he said, an apparent reference to the vehicle’s list price of $90 million. SpaceX Chief Executive Elon Musk said last month that the company spent more than half a billion dollars developing the Falcon Heavy. Trump did praise the space agency, though, for making “tremendous strides.” He didn’t elaborate on those efforts, beyond noting that “we’ll be sending something very beautiful to Mars in the very near future.” NASA is launching the InSight Mars lander mission on May 5. A model of NASA Space Launch System was also on the table but at a smaller scale than the other vehicles, such that it appeared dwarfed by the Atlas 5 posed next to it. After the Cabinet meeting, Pence highlighted SLS and Orion. “As I briefed @POTUS & @Cabinet today: with @NASA_SLS & @NASA_Orion leading the way back to the moon and with support of our commercial partners – the U.S. is keeping high skilled jobs & advancing us in the #NextFrontier,” he tweeted, attaching a map that showed that there were companies involved with SLS, Orion and ground systems in all 50 states. Trump’s comments appeared to encapsulate current policy that supports the continued development of commercial space capabilities. Space Policy Directive 1, signed by President Trump in December, called on NASA to work with “commercial and international partners” on its exploration program, refocused on the moon. NASA’s fiscal year 2019 budget proposal, released Feb. 12, requested $150 million to support initial development of commercial capabilities that could either take over operations of the International Space Station by 2025 or develop commercial successors. The proposal projected spending $900 million on that effort over five years. At the latest meeting of the Pence-chaired National Space Council, held Feb. 21 at the Kennedy Space Center, members approved several recommendations intended to support commercial space through regulatory changes. Those included streamlined launch licensing and a consolidation of other regulatory activities in the Office of Space Commerce within the Department of Commerce. While Pence briefed the Cabinet on the activities of the National Space Council, neither he nor Trump disclosed if they took any new actions based on that briefing. Trump, though, made it clear he supported private investment in space systems. “You know, rich guys, they love rocketships. And that’s good. That’s better than us paying for them,” he said.